Drawn to Action: The Life and Work of Arthur Szyk is a special exhibition that is open from now until January 31, 2015. 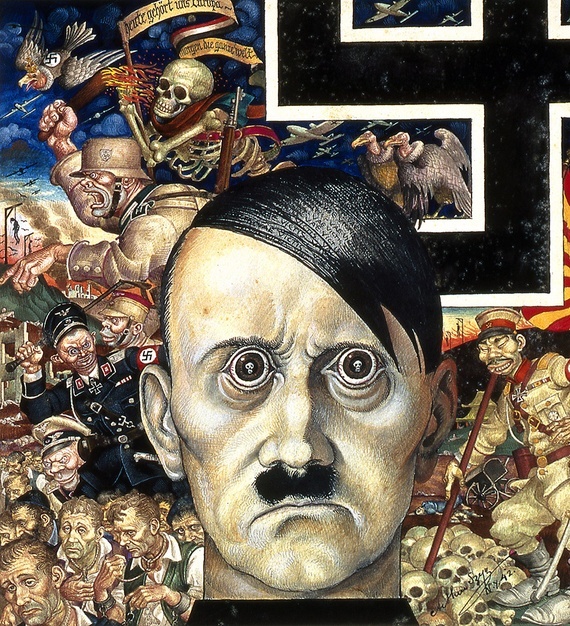 Arthur Szyk (1894-1951) was a Polish-Jew (and in the last decade of his life, an American-Jew) most known for his political and satirical caricatures of the Axis powers and its leaders. “Art is not my aim, it is my means.” Szyk proclaimed. You’ll notice his illustrations use a stimulating palette of color and are meticulously intricate. His great attention to detail have been compared to what you would see from medieval monks and renaissance painters. Ironically, before Szyk had even been to the United States, he did a series that depicted scenes of George Washington and the Revolutionary War. They were purchased by President Ignacy Moscicki of Poland as a gift for President Franklin D. Roosevelt and hung in the White House until 1943. Szyk would consider his greatest achievement to be his illustrated version of the Haggdah, which tells the story of the Jewish exodus from Egypt and took him 4 years to complete. As soon as the Nazi boots stepped onto Polish soil, Szyk reacted immediately. He expressed his feelings by fiercely taking pen to paper in a “creative fight against oppression”. He turned Hitler, Mussolini and the Japanese into extensively embellished and evil caricatures. His anti-Nazi cartoons continued to be effective propaganda when he left Europe in 1940 and settled in New York. He was on a mission, literally “to alert and inform the Americans about the gravity of the situation in Europe.” Eleanor Roosevelt described him as a “one-man army” for the Allied Cause. After World War II, Szyk embraced the patriotism of his adopted country and was granted American citizenship in 1948. Szyk continued to work and completed illustrations of Hans Christian Anderson fairy tales and even advertisements for Coca-Cola. Ever the activist, his later artwork allowed him to continue to be a voice against injustice… specifically against Jim Crow, the KKK and lynching. The exhibit officially opened on October 25, but be sure to catch the Opening Reception for this one-of-kind exhibition November 13 at 6:30 p.m. RSVPS are required at rsvp@dallasholocaustmuseum.org. The public is invited. Presenting sponsors for the Drawn to Action exhibit are Kathy and Harlan Crow and Gregg and Michelle Philipson Collection and Archive. Community Partners include the Jan Karski Polish School of Dallas.